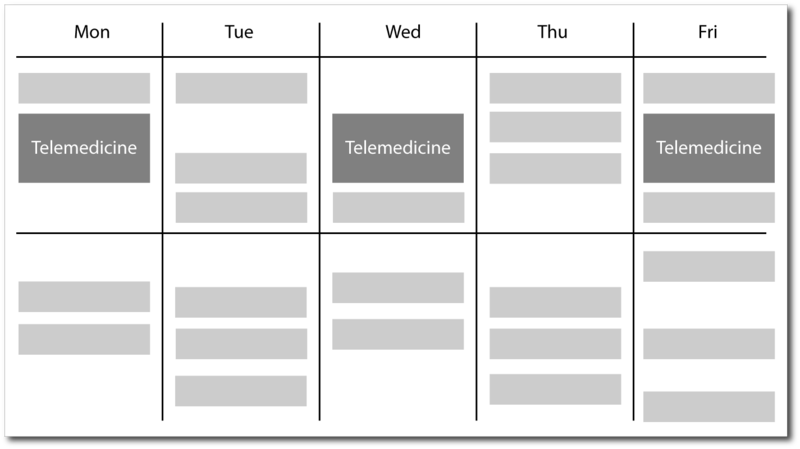 In block scheduling, time is set aside on the calendar for consecutive telemedicine visits (also called "video visits"). This is a very efficient way of conducting many visits in short order without interruption. It's important to realize that just because a request may fall in or outside of a block doesn't necessarily mean the visit can't be accommodated. Gives the provider a more set schedule ✅ Not always! Gives more time back to the office to perform other tasks ✅ Not always! Prevents burn out by allowing the practice to perform back-to-back-to-back video visits ✅ Not always! A common practice is for providers to conduct telemedicine visits from their home office in the morning, and then come into the medical office for the afternoon. For example, if you usually conduct a specific type of appointment (follow ups, lab result reviews, medication refills) in the mornings with block scheduling, this can easily be swapped out with video visits.